The Hayabusa2 probe launched the French-German Mobile Asteroid Surface Scout, or MASCOT, towards the Ryugu asteroid's surface. MASCOT would take data from the surface of the Ryugu asteroid to help study origins of the solar system. 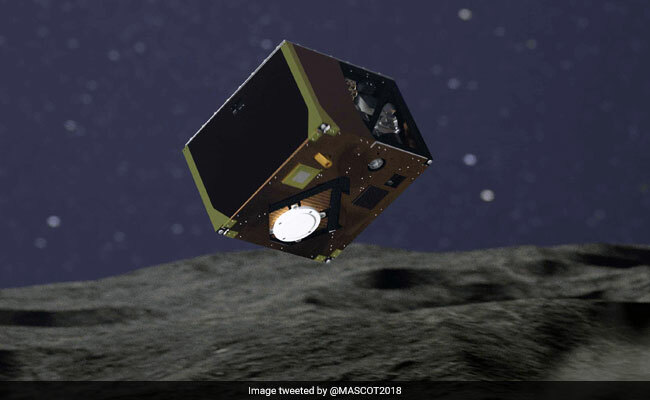 The Hayabusa2 probe launched the French-German Mobile Asteroid Surface Scout, or MASCOT, towards the Ryugu asteroid's surface, the Japan Aerospace Exploration Agency (JAXA) said. "We can confirm that the MASCOT separated from the spacecraft as planned," the agency said in a tweet on its official account. "I'm doing it! I'm descending to Ryugu! Can't stop me now!" the lander's official Twitter account @MASCOT2018 added. JAXA tweeted shortly after the landing began that it was in communication with MASCOT, but it was not clear when the agency would be able to confirm the robot had landed safely on the asteroid, where it is expected to collect a wide range of data. "It is hugely significant to take data from the surface of an asteroid, we have high expectations for the scientific data," Hayabusa2 mission manager Makoto Yoshikawa said at a briefing before the landing. The 10-kilogramme (22-pound) box-shaped MASCOT is loaded with sensors. It can take images at multiple wavelengths, investigate minerals with a microscope, gauge surface temperatures and measure magnetic fields. The rovers will take advantage of Ryugu's low gravity to jump around on the surface -- travelling as far as 15 metres (49 feet) while airbourne and staying in the air for as long as 15 minutes -- to survey the asteroid's physical features with cameras and sensors. Unlike those machines, MASCOT will be largely immobile -- it will "jump" just once on its mission, and it can turn on its sides. The Hayabusa2 is scheduled later this month to deploy an "impactor" that will explode above the asteroid, shooting a two-kilo (four-pound) copper object into it to blast a small crater on the surface. Hayabusa2, about the size of a large fridge and equipped with solar panels, is the successor to JAXA's first asteroid explorer, Hayabusa -- Japanese for falcon.